Treated wood for both handrails and balusters. Handrails height should be 30 inches. Balusters should be installed vertically, 32 inches long and 6 inches center to center. Steps need handrail and balusters on one side only. 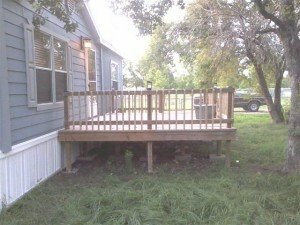 (1) This manufactured home inspection photo above is of decking and steps in excess of 30 inches in height that do not have the required hand rails and balusters. (2) Specifications for porch/landing/steps handrails and balusters. (3) Improperly installed steps. It has no handrail with balusters on one side.